While coming home with the State Championship Title was enough to celebrate, the awards for WA Basketball keep coming. The Florida High School Athletic Association named WA senior Chase Johnston the 4A Men’s Basketball Player of the Year. Chase’s accomplishments this year on the court include breaking a few records. First, he scored 52 points in a single game at the Montverde Academy Invitational, breaking the previous record held by Ben Simmons who is now a professional basketball player. Then, Chase set a new national high school boys’ record for all‐time career 3‐pointers. He ended his high school career with a total of 546 3‐pointers for his career. The Florida High School Athletic Association also named WA Men’s Basketball Coach, Ehren Wallhoff, the 4A Coach of the Year for the third consecutive year. This award came after leading the Lions to their third straight state championship. 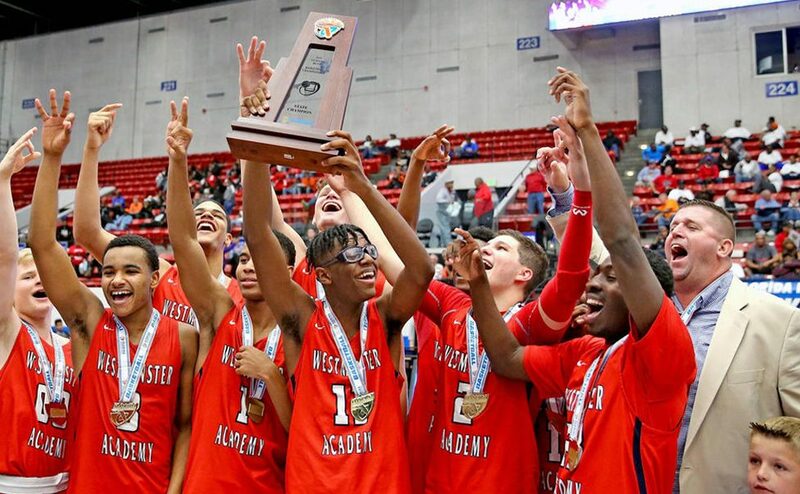 Westminster Academy is only the second school in Broward County to accomplish this feat in Men’s Basketball. With so much to celebrate, many want to honor our team’s accomplishments. County Commissioner Lamar Fisher issued a proclamation recognizing the team. Fort Lauderdale Commissioner Heather Moraitis will also honor our team at an upcoming City Commission Meeting. Most importantly, we will celebrate next week! All Lions Fans are invited to join us on Wednesday, March 27, during upper school chapel at 9:25 a.m. in the Coral Ridge Sanctuary. We will honor our team’s hard work and awards together at the conclusion of chapel.